With the advent of affordable 4K TVs and cameras, people now can easily get access to 4K videos to enjoy ultra high definition experience. With 4K technology is getting more attention, you may wonder what 4K is and what you can do with it. Here is a large picture about 4K and hope it will be helpful. 4K, labeled as Ultra High Definition (UHD) compared to High Definition of 1080P, has a resolution of 3840 x 2160, whilst 1080P consists of 1920 x 1080 pixels. People are familiar with 1080P and favor it for the high definition it provides. From above you can easily see that 4K is much superior, no matter on horizontal pixels or vertical ones. And a 4K video can present you much more details of the image. As a result 4K gives you a much clearer picture than regular HD and other formats. What can You Do with 4K? You can create 4K resources yourself for your 4K TV. All you need to do is to convert a regular video into 4K video with some help from some tool, then you can watch any content you want on your 4K TV with ultra high definition effect. Imagine that your DVD/Blu-ray movies and downloaded videos are in 4K resolution now! You may also need to scale a 4K video down to a smaller size for saving storing space or viewing on a non-UHD device. With some aid you can do this. And you will get an unexpected result – the downscaled video is more detailed and clearer than the non-processed video with the same size. 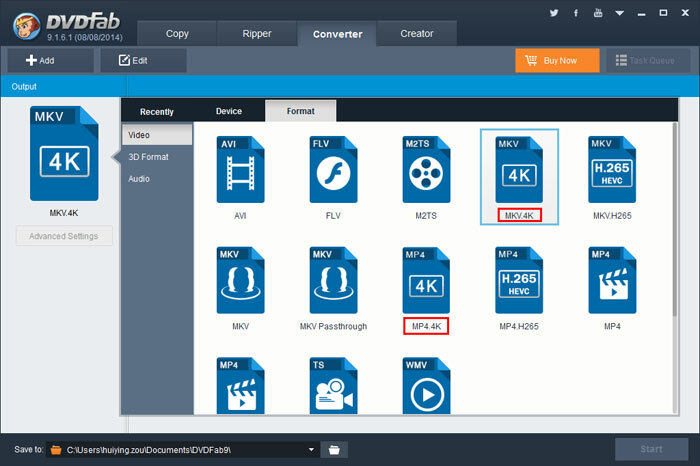 How to Set 4K in DVDFab? If you want to output a 4K video, just choose a 4K profile in Ripper or Converter option according to the type of the source.